Timber Wolf's® exclusive use of low tensioned, high ductile Swedish silicon steel, unique geometric gullet designs and sets, unique manufacturing processes and quality control that is unsurpassed in the business has resulted in the production of the finest bandsaw blades in the world. 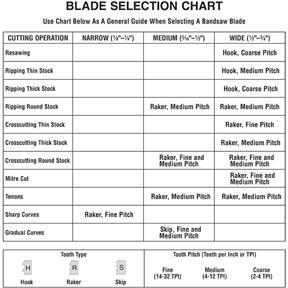 High Performance (HP) and Raker (RK) blades are specifically designed for detail work in 1" and smaller kiln dried wood when a very clean finish is required. 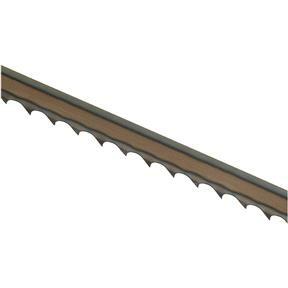 They are also effective in plywood and other woods where tear-out is a concern as well as in the cutting of soft metals. AS-S blades are only .025" thick with a total overall set of only .048 thousandths of an inch. These bands were specifically designed for straight-line resawing in very expensive, thick woods. These blades utilize the thinnest kerf possible and provide a super finish when speed is not a concern.